Started with this kids shirt... way too small for me but I loved the tiger! Side view! Sooo I've worn it a couple of times and I actually love it, but the feedback I have gotten is "wow that shirt is weird" "yeah, but does it look good?" "I don't even know how to evaluate... it looks weird" and assorted similar comments. So I am assuming it is a failed experiment and does not look right. BUT - I actually kinda like it. Try to "save" it? (Suggestions?) Toss it? Redo the whole thing? Leave it as is and keep loving my "weird" style? Let me know what you think! And I could imagine it in a fancy fashion magazine on a skinny model wearing black high waist jeans and a black tube bra underneath. But if people aren't used to see such avant-garde clothing (on you) maybe it seem far out to them. What is more important: Do you like it? I don't find it weird at all. I have quite conservative taste, and I like this piece - it's pretty normal looking to me, but with nice details. I especially like the lace straps. 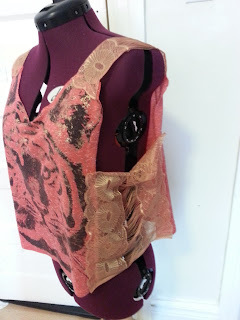 Does it look significantly different on you, compared to on your dress form? If not, I am perplexed as to why anyone would think it weird! Love it. Ignore the haters. I don't think it's weird either. 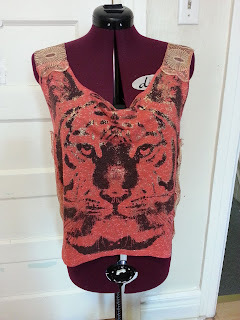 In fact, I think it's a brilliant way to up-size a kids' top. Great job! I quite like this. 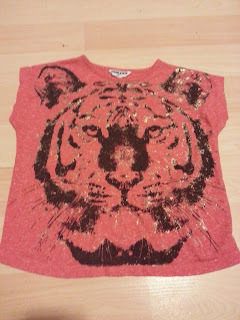 The gold lace ties in so nicely with the design of the tiger.... what a great idea for a kids shirt transformation. I could see something like this selling in an upscale fashion clothing store.